Great gift item. Effective support for your abdomen. Eases back pain during pregnancy. Adjustable hook and eye closures won't snag expensive lingerie, unlike "sticky type" closures. Supports umbilical hernia. Can be positioned higher or lower for maximum support, or placed for the support of an umbilical hernia. 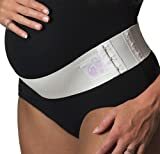 I started wearing the Mini Cradle two weeks ago and have noticed a significant improvement in stomach and back pain. It's the smartest $15 I've ever spent!